Ladies and gentlemen, it's about to get a little crazy around here. Welcome to Oscar Week! In just six short days, the curtain will raise at the (soon-to-be former) Kodak Theater in Los Angeles and Billy Crystal will glide on stage to usher us into the 84th Annual Academy Awards. Of course, before that happens there is a lot of work to get done: the predictions, the red carpet rundowns and the endless assessing of everyone's chances (or lack thereof) of getting a golden statue. To celebrate Sunday's big event, I will be breaking down my predictions in the nine "major" categories all week long here on the blog and then revealing my complete ballot of predictions on Saturday. But it wouldn't be fun if I was the only one throwing out my opinions, now would it? Nope... it's time for you to weigh in. 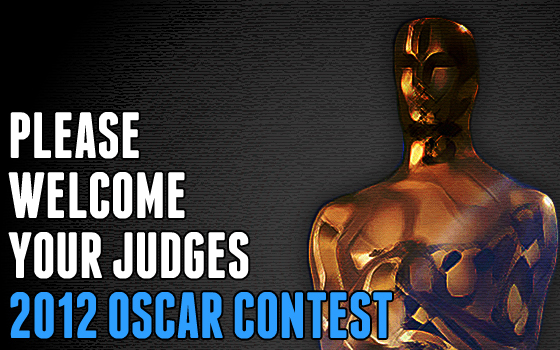 Fill out your contact information and select who you think will walk away with an Oscar in the 9 major categories (Picture, Directing, Acting, Writing, Animation). Make sure to answer the tie-breaker question! Watch the Oscars this Sunday and see how your predictions match up. Come back here to see if you've won! Each of the categories is weighted to total 100 points. The entrant with the highest score will win the prize. In the case of a tie, the tie-breaker question will determine the winner. Limit 1 entry per person, 250 total entries. Final deadline to enter is Sunday, February 26th at 6:30pm (unless 250 people enter before then). Entrants must live in the continental United States. THE PRIZE: One (1) DVD of a 2012 Oscar-winning film of your choice. Good luck and don't forget to keep checking back here to see my official predictions!